Veni, vidi, vici, now is the time to seize the day - you might also want to seize the broom or newspaper, depending on how you want to accessorize your costume - when your child is wearing this Child Victorian Poor Boy Costume! 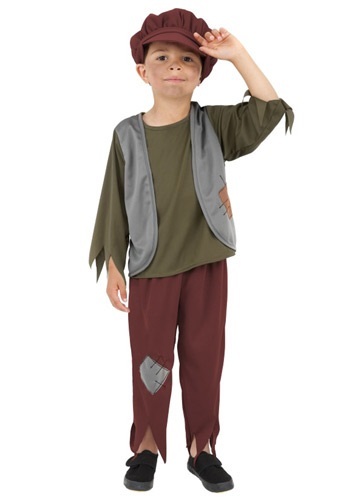 Next thing you know, your child will be singing and dancing with all the other paper boys or chimney sweeps in town. Pretty soon, he may even be hopping from chimney top to chimney top with a broom in hand. If your child does manage to get swept off in a singing and dancing frenzy, make sure not to let them out of your sight. Wait, who are we kidding? Keeping track of them will be an easy task, since your child is sure to stand out from the crowd in this costume! From top to bottom, this costume looks like it is straight out of the Victorian era. The shirt sleeves and pant cuffs are pre-frayed to perfect degradation for your convenience, while the vest and pants contain patches that add to the “poor boy” aesthetic. The olive green of the shirt, contrasts perfectly with the brown of the pants, and is topped off nicely with the blue attached vest. However, no Victorian Poor Boy Costume is truly complete without our felt lined brown newsboy cap! While some hats may be a mistake, you can rest assured knowing that you can never go wrong with this era-inspired cap. So, what are you waiting for? Seize the day and this costume right now!